Ever since I was a little girl, I’ve been creative. And I’ve tried close to every type of art and craft out there. I have been known to wander down the aisles of craft stores swooning over paint, yarn and embroidery floss. But after practicing the art of quilling paper for the last 6 or so years, I have come to the realization of quite a few reasons why quilling is the perfect craft! Compared to so many other crafts, the basic equipment that you need to start quilling really costs peanuts! And, if you’re really creative and thrifty, you could get away with even less! Cut your own paper from what you have in your craft closet. Coil your strips around a needle, wooden dowel or even a toothpick! 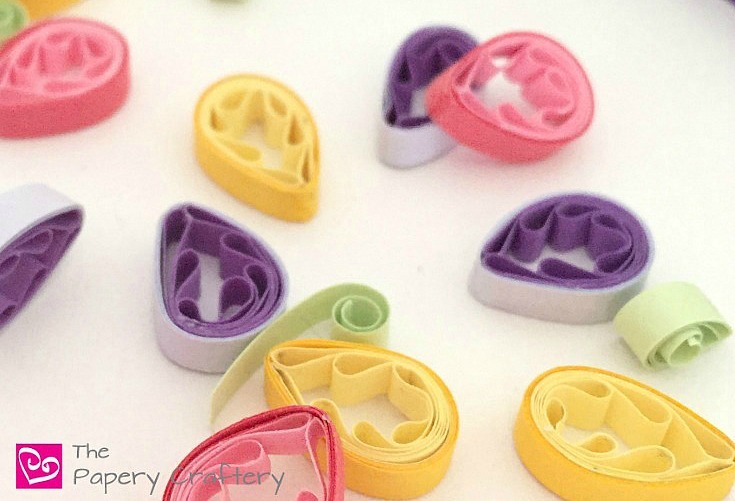 The first steps of quilling simply involve coiling a long strip of paper around a needle tool. Sure, there are many advanced techniques, but the basic coils and shapes don’t involve tons of specialized know-how. Once you have the first steps down, you can create anything! Yep, you read that right! There have been many times where I’ve been up against a deadline close to a family road trip and I’ve had to take my quilling on the road. It’s definitely not the easiest way to quill paper, but if you’ve got a few dozen teardrop coils to produce for some gift tags and a limited amount of time, its totally doable in the car! Comparatively to stacks of canvases, or shelves of ceramic jars, both quilling paper and the finished product don’t take up tons of space. There are lots of ways to store quilling paper and, depending on your project, finished quillings are usually fairly sturdy and strong. Quilling has been around for centuries, and it’s popularity has risen and fallen through the years, but it’s still not extremely widely practiced. Although sometimes that means you’ll have to do a bit of explaining as to what quilling actually is, if you’re looking for an uncommon craft, quilling is it! There have been so many times that I hear “I can’t believe its made of paper!” from a buyer when one of my quillings get delivered. It’s always such an honor to have my work so well appreciated by others! What are your favorite reasons to practice quilling? Leave a comment below! I have been Quilling for about a month. I have alot to learning to do but I like it. That’s great, Tracy! Welcome to the quilling club! Like you I think I have tried every type of craft. I find Quilling quite relaxing. I have also taken mine on holiday for when I can’t sleep. I like trying different techniques and I find your videos invaluable. Look forward to more. That’s so great to hear, Dawn! Thanks so much! I’m glad I’m not the only one who travels with their quilling supplies. I’ve tried about every craft there is but I’ve never tried quilling! I may have to try it after reading this! Great, Leah! I hope you do! Where have I been, never heard of this, but this looks so neat!! Lol, Trish! Quilling isn’t hugely popular right now, but I’m trying to bring it back! Beautiful! This would be a great craft for my daughter and I to learn together. Thanks! I hope you two enjoy quilling! This is one craft I have never tried to do. Looks like fun and think I could get the hang of it. I bet you could pretty easily! It is pretty fun! I hope you’ll give it a try! That looks so fun. I haven’t tried quilling yet. I’ll have to give it a try. Thanks for sharing. So glad you stopped by, Devon! I’m a big fan of mixing media, too. And I agree, tweezers are a huge help!